Plan of Delhi and its Environs. 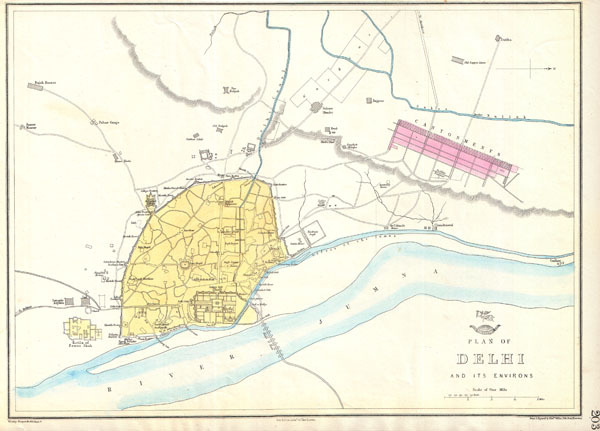 This is a seldom seen map of Delhi, India, dating to 1858, by London cartographer Edward Weller. Depicts the city of Delhi shortly after the suppression of the Indian Mutiny in 1857. Oriented to the west. Shows what is today Old Delhi west of the Jumna River. Depicts the old city walls, palaces, gates, bazaars, mosques, temples, grave sites and tombs, streets and municipal buildings. Shows the pontoon bridge crossing the Jumna as well as the cantonments to the north of the city. Originally part of the Weekly Dispatch Atlas, but issued only in the 1863 production of the complete Atlas. Edward Weller (18?? - 1884) was a cartographer and engraver based in London. His best known work appears in Cassell's Weekly Dispatch Atlas, published in monthly segments for subscribers of the "Weekly Dispatch" newspaper. This collection of maps eventually grew to include much of the known world. Published in various editions from 1855 through the early 1880s. The "Weekly Dispatch" had its offices at 138 Fleet Street, London, England. Cassell’s Weekly Dispatch Atlas c. 1863. Very good condition. Narrow top margin, else clean.